A ramp with a handrail is being installed at East United Methodist Church in Savannah, Tennessee. Thanks to a $10,000 grant from the Golden Cross Foundation, this and other retrofitting projects such as a covered walkway and updated restrooms with fixtures and handrails will make the church more welcoming, accessible, and safe for all who attend. East End United Methodist Church (UMC) in Savannah, Tennessee, received a grant for $10,000 from the Golden Cross Foundation, a non-profit corporation and extension ministry of the Tennessee Conference of The United Methodist Church. Money from this grant is being used toward retrofitting restrooms with fixtures and handrails, enhancing the sanctuary’s sound system, and installing interior and exterior ramps and a covered walkway. Together with money raised from a church program called Heavenly Dollars—members save one-dollar bills with an H which the church collects and puts into a special projects fund—and other special fund raising, the grant money is being used to make additional changes. 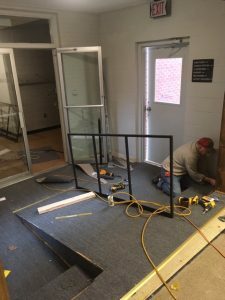 “Currently, interior and exterior ramps are being installed to provide safe access to those who have difficulty with steps or need wheelchair accessibility,” said Shelby. In addition, restrooms will be retrofitted with fixtures and handrails; one will be completely redone to be wheelchair and walker accessible. Other future improvements include enhancing the sound system to assist the hearing impaired and allow for translation for members who speak limited English and building a covered walkway accommodating those in wheelchairs or with walkers to safely enter the church from the parking lot. “We hope and pray that members and visitors who were unable to access our facility for fear of falling or who have difficulty hearing during worship or navigating in small bathrooms will now be encouraged to attend,” said Shelby. “We want everyone to know they are an important part of our ministry. Far too often, as people age, they feel the church doesn’t or can’t provide for their physical needs. As a result, they stay home. We want all who come to East End UMC to be able to enter the building without getting wet on a rainy day, access the sanctuary without the fear of falling, and have privacy in an appropriately designed bathroom. Shelby is especially grateful to members of the administrative committee for their help in successfully implementing the grant. Led by board of trustees chair Kenny Whitlow, committee members are the Rev. Thad Calton, Paul Warrington, Matt Colburn, Cherry Denise Johnson, Mary Roe, Betty Franks, Renee Alexander, and Patti Reed.